As I look back at 2012 there are many people who inspired me. They're very much the reason why I love our sport. Starting at the Midwinters, Peter Shope showed us all how you can weigh 175 pounds and still be really competitive in a breeze. During Midweek Madness, Peter arranged a clinic by Luke Lawrence who showed how much there is to gain with great downwind technique - something that became really clear at the Brisbane Master Worlds. Of course, the Worlds have tons of great inspirational people and most of them have signed up again for the Oman Worlds in November. But two stand out: Brett Beyer is the best coach I have ever met, and Lyndall Patterson is the only woman to ever win a Laser Worlds against the men. I've known Lyndall for almost 40 years and she has always been awesome. For the entire time that we were in Brisbane a lone 470 would go out and practice every day, even when there was not enough wind for a race. It was of course Malcolm Page and Mathew Belcher. At the London Olympics, it was no surprise who won gold. After the Worlds, we caught up with Julian Bethwaite in Sydney. He's doing some amazing things that we can all benefit from. On our last day, I was proud to introduce Pam to Frank Bethwaite who was such an inspiration to me when I first arrived in Sydney as a 20-year-old kid. Closer to home, Fred's Easter Regatta is the best event in Texas. Great price, competition, food, and all of those bunny prizes! At the Gulf Coast Championships, Greg Martinez was a pleasure to sail with. He was quick upwind and had fantastic speed downwind. Sooooo much speed! 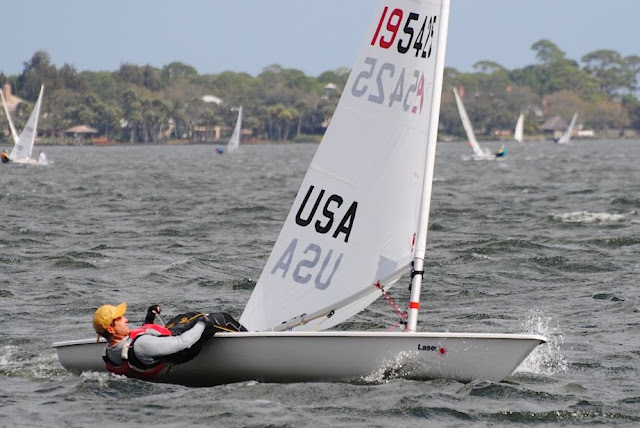 This event was followed by the Laser Nationals where only 16 full-rigs signed up. I decided to sail a Radial with 45 sailors who were mostly in their teens. They were exceptionally talented and much better than I was at that age. They were polite ('please sir, can we start now?' when I was late pulling the trigger), had great parental support, and were really fast downwind. The standout was World Youth Champion Erika Reineke who was fun to watch. She was the fastest person downwind. Again, sooooo much speed! But the best part was that the fleet was clean, not like a lot of college sailors that we see. Another person who inspired me was Bruce Kirby who called us after reading one of Pam's articles. I do not know what I'd be doing without his Laser design but I'm sure it would not be as much fun. Or as challenging. Or with the same amazing people from around the world. In District 15, the Houston sailors are revving up participation and inspiring others to travel again. Here in Dallas, Greg Wallace is new to Lasers and made it to every single circuit event. Dallas sailor Eddie Lockey was my crew at the US Sailing Championship of Champions event and proved that excellent crew work is no match for a brain-dead skipper trying to learn how to sail a C-Scow. 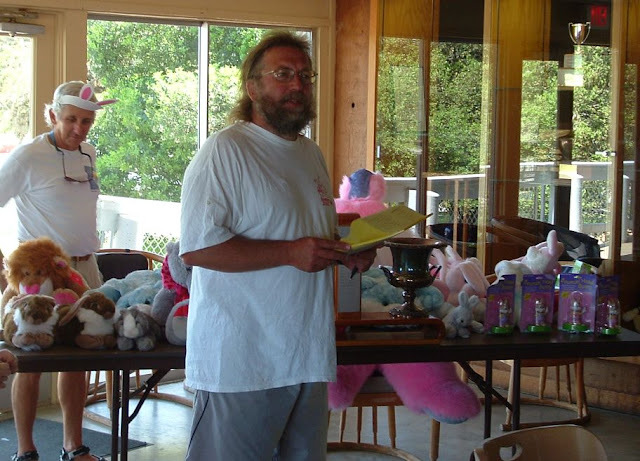 It would be unthinkable to not mention Tillerman whose blog is the gold standard for all other sailing blogs. Every time we're looking for a new idea, we get one from him or one of his readers. And then of course there's Brad Salzmann whose story inspires me every time I read it. To count Brad as a friend just makes it even more special. Finally, I'm constantly inspired by people who take the time to promote our sport, by those who travel to regattas, who reach outside their comfort zone, and by all the newcomers young and old. What an amazing year! What an awesome sport! And what amazing people! There were so many more who I could mention. I'm really looking forward to see what 2013 has in store for us. I am humbled to be mentioned on the same list as all those great sailors who have done so much for our sport. Wait. Did I mean "humbled"? Or the opposite? Should I have said "honored"? I'm really not much good with words. You're in even better company... I've just added 2 more people from Brisbane: Mathew Belcher and Malcolm Page. We're all honored to have a sport where we can rub shoulders with so many great athletes. And I'm glad you put Peter Shope first on the list. I sailed with him quite a lot in Rhode Island until he moved to California. He was one of our Tuesday night practice group in Bristol. A great sailor and a really nice guy. Always very happy to answer questions and pass on his knowledge. Yes, people like Peter represent all that is good in our sport.